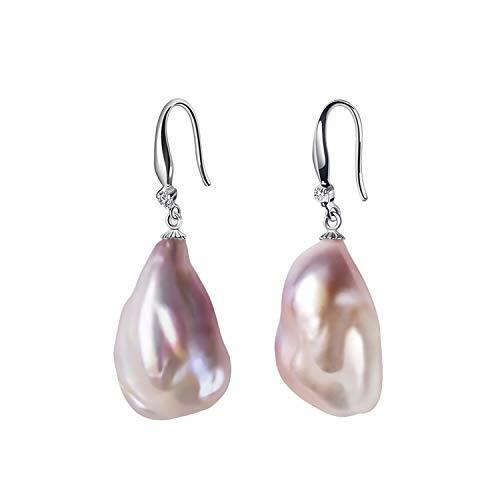 These pearl earrings feature a coin shaped cultured freshwater pearl. Their base color is ivory and they have an AB (aurora borealis) sheen that casts subtle pastel pinks, blues, greens, and golds. This was hard to capture in the photos. The pearls measure about 1/2" (8-12 mm) in diameter. Due to the fact that these were made by nature, no two pearls will be alike. Variances will include pitting, texture, blobs, bumps, irregular shape, irregular thickness, color, and different sizes. They dangle 1 1/4" from hypoallergenic Sterling silver fish hook style ear wires. 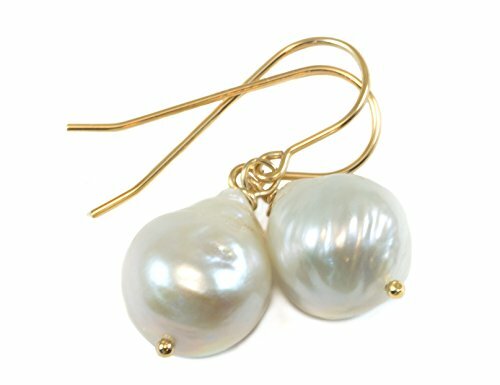 These coin pearl drop earrings would be perfect for a bride to wear at her wedding, or for the bridesmaids and maid of honor. Understated elegance that will last a lifetime. Pls note: Due to the one-of-a-kind nature baroque pearls, exact color patterns may vary slightly from the image shown,but each one is hand-selected and beautiful. Pearls are shiny and durable, not fading. 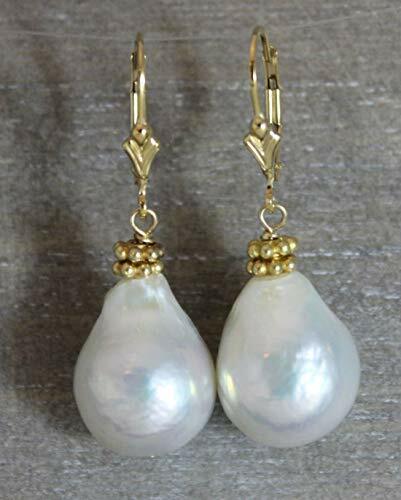 Sterling Silver White Baroque Freshwater Cultured Pearl Hook Dangle Drop Earrings About Baroque Pearls: Baroque pearls are pearls with an irregular non-spherical shape. Shapes can range from minor aberrations to distinctly ovoid, curved, pinch, or lumpy shapes. Most cultured freshwater pearls are baroque because freshwater pearls are mantle-tissue nucleated instead of bead nucleated. Cultured saltwater pearls can also be baroque, but tend to be more teardrop-shaped due to the use of a spherical nucleation bead. NOTE: The natural properties and process of pearl formation define the unique beautify of each pearl. The image may show slight differences in surface, color, size and shape. 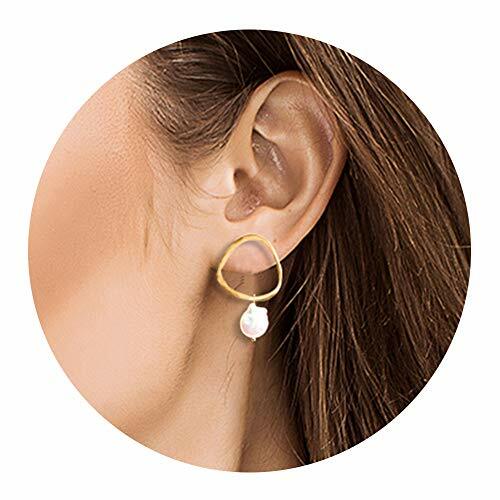 Pearl Earrings Specifications: Style: Dangle & Drop Metal Type: 925 Sterling Silver Pearl Pearl Type: Freshwater Cultured Baroque Pearl Package Contents: 1x Pair of Baroque Pearl Dangle Earrings 1x White Wipe Cloth 1x Elegant Gift Box Pearl Maintenance and Precautions: 1. Avoid contact with hairspray, perfume, skin care products or any alkali products together. 2. When not wearing, be sure to thoroughly dried before storage to be placed, in order to avoid moisture to make them lose their luster and often wipe with a soft cloth make it often new. 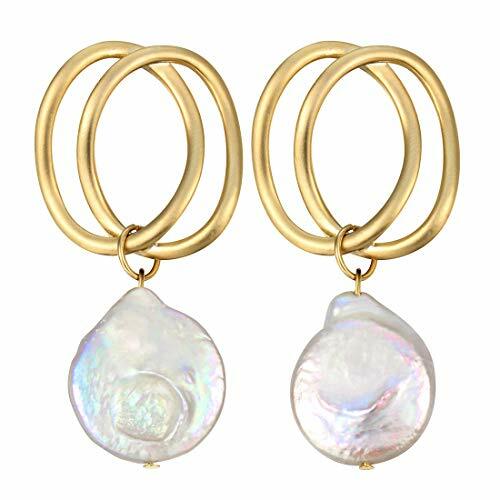 A jewelry collection is not complete without a pair of timeless freshwater pearl earrings, and our drop-shaped version is the perfect go-to pair that's wearable from work to weddings. 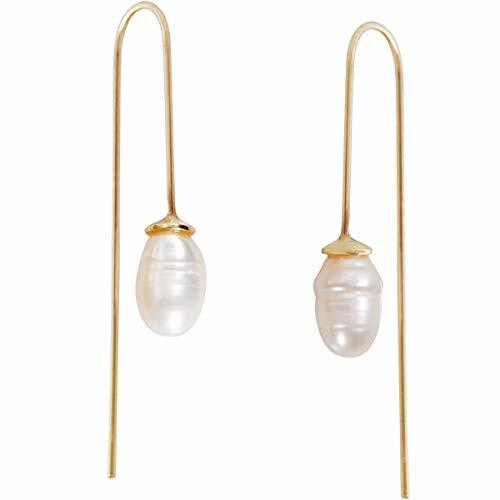 Designed in an elongated threader wire silhouette, these glamorous dangle earrings feature an off-rounded imitation bead inspired by baroque-shaped freshwater pearls. The high-shine droplets feature a smooth texture with symmetrical pinches and curves. Add these threader earrings to any day-to-night outfit or special occasion ensemble for a polished look that's at once classic, simple, and elegant. Approximate Measurements: 2 inches. Hand packaged with love in the USA in a signature Humble Chic gift box. The perfect present for yourself or loved ones, for birthdays, anniversaries, the holiday gift season, or Valentine's Day. Choose this special gift to show your love and friendship to your wife, daughter or friends. Search or click on "Humble Chic NY" to see our complete collection on Amazon. 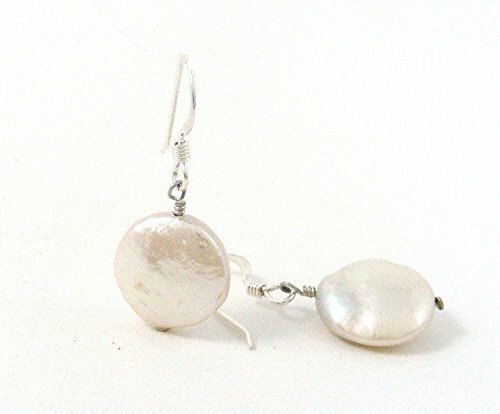 ✦✦ Large Baroque Pearls are wirewrapped on 14kt Gold filled leverbacks. ✦✦ I have also wirewrapped a small vermeil bead. ✦✦ Size of Pearls are 14x17mm Length is 4.1 cm. ✦✦ These are great for both every day and a night on the town! This White Freshwater pearl necklace set is certain to be a favorite for any occasion. 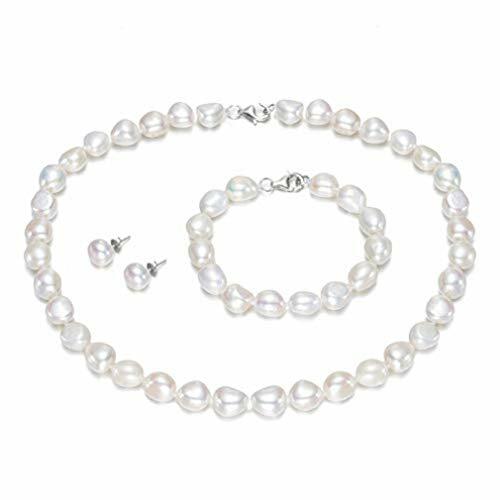 This pearl necklace set is compiled of beautiful hand picked pearls with an "excellent" grade luster and are AAA in quality, and with natural nugget baroque pearl shape. The pearl necklace is white in color and comes with a very good sterling silver fitting. All products are shipped in an elegant jewelry box or jewelry bag, creating a truly beautiful presentation. Enhance your jewelry collection with these 5-5.5mm Freshwater Pearl Stud Earrings. This classic jewelry set lets you flaunt your elegant and sophisticated style, while looking absolutely fabulous. Crafted of sterling silver, it consists of an array of beautiful colors, ranging in hue from bronze, brown, gray and night blue to white, peach, peacock fuchsia, pink and teal. With this set of 10 cultured pearl stud earrings, you can create a different look every day. Genuine 8.5-9mm White Freshwater Cultured Pearl Button Stud Earrings with post backs. Rhodium Plated In 925 Sterling Silver. Sterling silver french wire earrings with white baroque cultured freshwater pearl drops. The pearls are approximately 13mm x 17mm, but will vary slightly in shape and size. The earrings hang approximately 32mm. .925 sterling silver. Pearls may be bleached or dyed. For centuries, pearls have been a symbol of beauty and purity. Today they are regarded as both classic and contemporary, coming in many more fashionable styles than your mother's traditional strand of pearls. Accent the look of any ensemble with this classic Sterling Silver Gray 11-12mm Irregular Freshwater Pearl Set. Straightforward in design and unmatched with luster, these button-round cultured freshwater pearl stud earrings are ideal for everyday wear. Each adorable earring rests on a 10K gold post back with a friction closure. And all for an incredible low price! Pearls add a heavenly glow to any outfit with their beauty and shine. 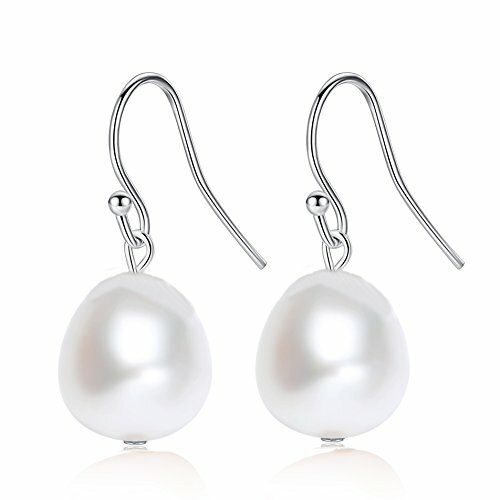 In these earrings serene and elegant genuine freshwater pearls radiate from glamorous .925 sterling silver stud settings. A simple and pure look. Add variety to your collection with these unique earrings! 9-10 mm freshwater baroque pearls suspend from three sterling silver links decorated with round-cut black and white diamonds, totaling 1/5 ct. 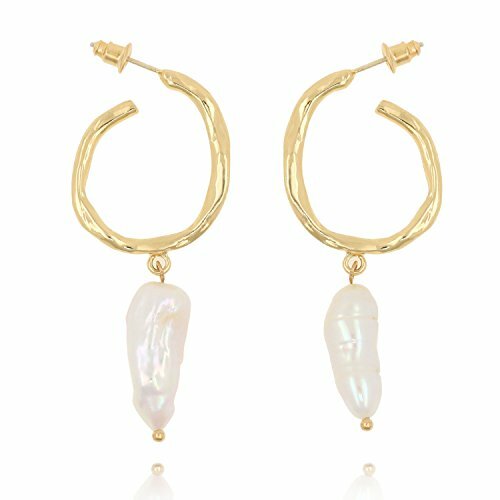 Convert these drops into hoops by removing the pearl-and-link pieces, leaving you with glamorous and dainty hoops you can wear anywhere. Pieces measure 1 5/8 by 3/8 inches.When it comes to jewelry, our mission is to provide our customers with the highest quality pieces at the best prices online. From diamonds and gemstones to designer finds-for-less, we offer a variety of styles, metals, and stones to fit your particular taste and budget. Special occasions and every day style is a passion for us too! Now you don't have to spend any more than you need to on both trendy and timeless styles with our selection of gleaming gemstones, precious metals, and chic everyday finds. Whether you're shopping for someone you love (we've got Mother's Day, Father's Day, Valentine's Day, birthdays, and the holiday season covered!) or shopping 'just because,' you'll always find the perfect piece in our carefully curated treasure chest. For centuries, pearls have been a symbol of beauty and purity. Today they are regarded as both classic and contemporary, coming in many more fashionable styles than your mother's traditional strand of pearls. Accent the look of any ensemble with this classic Sterling Silver Pink 11-12mm Irregular Freshwater Pearl Set. For centuries, pearls have been a symbol of beauty and purity. Today they are regarded as both classic and contemporary, coming in many more fashionable styles than your mother's traditional strand of pearls. Accent the look of any ensemble with this classic 10mm-12mm Freshwater Pearl Necklace & Lever Back Earring. This hand-knotted cultured pearl Necklace is secured with a lovely Ball Clasp and makes a beautiful gift for all occasions. For centuries, pearls have been a symbol of beauty and purity. Today they are regarded as both classic and contemporary, coming in many more fashionable styles than your mother's traditional strand of pearls. Accent the look of any ensemble with this classic Sterling Silver Black 11-12mm Irregular Freshwater Pearl Set.